Akihabara is known to be the center of electronics in Tokyo but since we're staying with my cousin in Sagamihara, the nearest electronic store from our place is Yodobashi Camera Machida branch. Yodobashi Camera is a store that started selling anything and everything related to cameras. But as time passed by, they started offering other products like mobile phones, laptops, desktop and even home equipments! When shopping in Yodobashi, make sure you get a Golds Point Plus card. According to my cousin, it's free and ready to use as soon as you sign up. With that card you get 3-10% discount depending on the item you'll buy. The discount will then be converted to points. Remember, 1 point is equivalent to 1 yen. 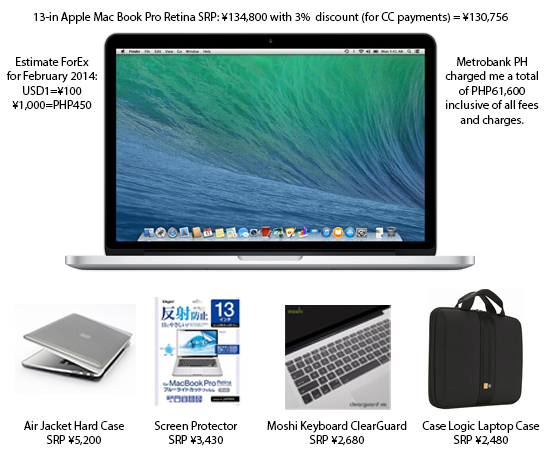 The SRP in the Philippines for the laptop alone is ₱67,990 so I saved ₱6,390. 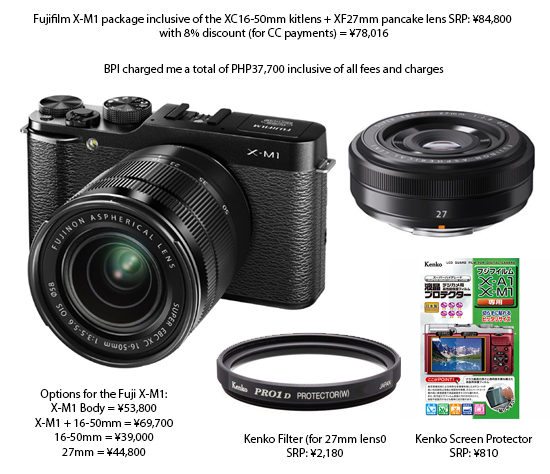 The package (X-M1 + 16-50mm kit lens + 27mm pancake lens) I got in Japan is not available in Manila but the SRP of X-M1 with kit lens is ₱34,000 so I saved ₱3,700. I hope you understood the images I posted. To make the long story short, all the accessories; air jacket hard case, moshi keyboard clearguard, case logic laptop case, kenko lens filter and both screen protectors are all FREE using the points I earned from the laptop and camera I got in Yodobashi. Yes, free. Do the math, compute for the total amount of all the freebies I got and you'll see that I actually saved a lot of money. The only disadvantage of shopping in Yodobashi is that some items might not have international warranty. Make sure to ask before purchasing. P.S. Don't worry about getting scammed or whatnot. The Japs I think are the most honest people on earth. Also, try to haggle with the sales person by shopping with or like a local. It worked for us! We got a few more items like Casio watches and SanDisk extreme pro memory cards at an extremely low price, kulang na lang ibigay sa amin ng libre. Haha.